I made this dish for my dear friend Jennifer who I have known for many many many years. Because she is so wise she decided recently that the two of us — just the two of us, no kids, no significant others — needed to commit to a monthly date. And by golly we’ve done it. Last month I invited her over for dinner and this is what I served. True story: Jennifer once had this baby? And we were so fascinated by this extraordinary child that I would come over on a Saturday night, we’d order Chinese food, and just watch this infant do almost literally nothing, for hours. She’s 23 now. Thank God for the internet because we now have other ways of watching almost nothing. This recipe is irrefutable proof that a weeknight meal can be elegant and fast. 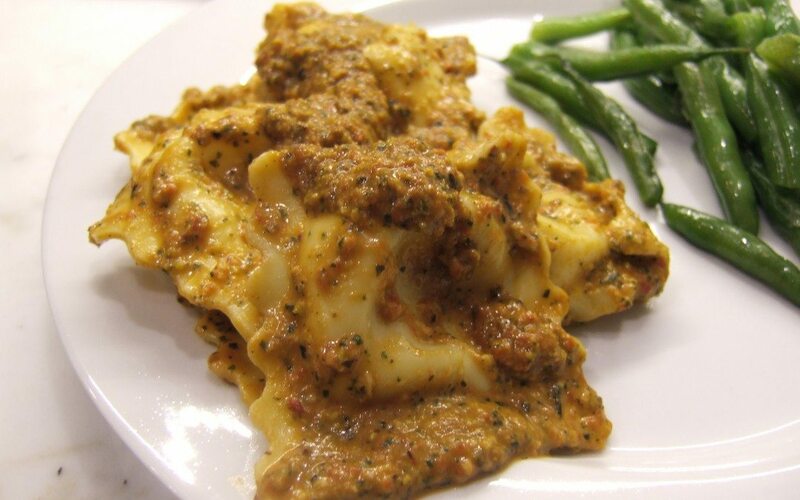 Thanks to store-bought ravioli, all you have to do is puree some garlic, jarred red peppers (one of my favorite pantry staples – seriously, if you don’t always have a jar of these in your cabinet or fridge I just don’t know what you’re thinking), basil, parmesan and pistachio nuts in your food processor and boil the pasta. Aside from not eating all the pistachios ahead of time there is nothing the least bit difficult here. I absolutely love the combination of the red pepper and pistachio nuts — such a nice change from more traditional pasta sauces. There are several variations on the sauce including: Sage, Walnut and Browned Butter, Green Olive, Almond and Orange, and Kale and Sunflower Seed. A salad would be perfect but I had grabbed some really good green beans at Whole Foods and they were great too. As the other half of this date, I can vouch that it was truly delicious. So is the 23 year old, who i still like to watch do pretty much nothing, or whatever she is doing!